In Different Engines, Professor Mark Brake and Reverend Neil Hook take us on a tour of science fiction through the ages. They show how the genre extends far beyond mere entertainment and often provides a profound exploration of the interface between science and society and the impact that new technologies or discoveries, such as that of alien life, are likely to have. The book divides the history of science fiction, which is as old as science itself, into distinct eras. The book begins in the time of the Renaissance with the Age of Discovery before chronologically stepping through chapters on the so-called Mechanical, Astounding, Atomic, New, Computer and Biology Ages. Along the way, Different Engines offers some absolute gems of interesting facts. For example, the 1929 German science fiction film ‘Women in the Moon’ shows the first ever use of a count-down in the launch of a rocket, invented for the film purely as a dramatic device. Luke Skywalker’s lightsaber has its roots right back in the 1920s when the energy sword was ‘invented’ by pulp sci-fi writer Edmond Hamilton, of whom George Lucas was a great fan. There is much of significance to astrobiology here, beginning with the once-sacrilegious discussions on the plurality of worlds and earliest novels on space travel and meeting beings beyond the Earth (the romantic duellist Cyrano de Bergerac is credited with writing one of the first such science fiction novels about traveling to the moon and meeting the ‘Lunarians’). The section of most relevance is the final chapter, The Age of Biology. Brake and Hook explore the meaning of humanity in its cosmic context and chart the changing concept of the ‘alien’ and its importance within society, including a discussion on the implications of discovering extraterrestrial life. Extraterrestrials are often portrayed in literature and cinema as either merciless invaders or caring benefactors to humanity, but Different Engines clearly makes the point that within science fiction the behaviour of the aliens and the response of humans is used as a literary device for holding up a mirror to ourselves in order to explore humanity. Science fiction is never about unrecognisably novel scenarios or characters, but about us, here and now. The genre uses future times or distant worlds as a convenient device for obtaining an external perspective and reflecting on, or parodying, the hopes and concerns of current society. For example, in the post-WWII years science fiction was dominated by super weapons and post-apocalpytic survival tales, before yielding to cautionary tales of artificial intelligence, surveillance society and nanotechnology. 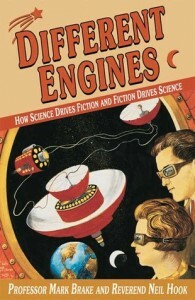 Different Engines argues convincingly that Science and Science Fiction are inseparable enterprises. Many figures famous for their novels also made important contributions to scientific research (H.G. Wells, for example, contributed to a 1888 debate at the Royal College of Science on the topic ‘Are the Planets Habitable?’) and many scientists also expressed their ideas through literature (Kepler published several stories of space travel and aliens). The central tenet of the book is that although science clearly drives science fiction, fiction in turn drives science, through inspiring young minds, for example. NASA acknowledged sci-fi’s inspirational influence by naming its first space shuttle Enterprise. Science and science fiction are the two ‘different engines’ of the title, and both are crucial to the quest for greater understanding. Within astrobiology, scientific research and science fiction are both needed in the free discussion of ideas and preparing society for potentially ground-breaking discoveries.